SUGAR raises diabetes AND dementia risk. Will research into the hormone "amylin" reveal the reason why? University of California's Dr. Robert Lustig built a team of statisticians and epidemiologists to look at the relationship between food and diabetes risk. The now famous paper on sugar and diabetes, published in the professional journal PLoS One, found that the more sugar on the market in 175 countries, the higher the country's diabetes rate. Professor Lustig said, "I'm not suggesting sugar is the only cause of diabetes. But in this analysis it was the only thing that predicted it. And it was worldwide and over a decade." The researchers found that for every can of sweetened soda available per person per day (150 calories), diabetes in the population rose 1%. The same number of calories any other type of food only caused a 0.1 percent increase in a population's diabetes rate over the past decade. The researchers took into account obesity, exercise, along with various societal and economic variables. Is Sugar Really to Blame for Alzheimer's? In the video and article entitled, "Sugar and Dementia," researchers shared rich data demonstrating that the more sugar a person eats, the higher their risk for dementia. Is all this research connected? 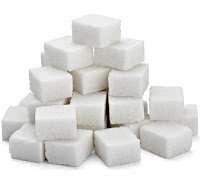 Is there a sugar - diabetes - dementia triangle? A study at the NIA-funded Alzheimer's Disease Center at the University of California, Davis, suggests they are connected by the hormone called "amylin". Deposits of the hormone amylin in the brain may indicate risk for developing dementia and type 2 diabetes, according to this study published online in the Annals of Neurology. The analysis is the first to identify amylin deposits in post-mortem brain tissue from older people who had been diagnosed with Alzheimer's or vascular dementia and diabetes. The findings also indicated that amylin may play a similar role in the Alzheimer's disease process as amyloid protein, a hallmark of the disorder. Amylin (also known as islet amyloid polypeptide) is a hormone expressed and secreted with insulin. It influences blood sugar levels; when too much is secreted, risk for developing diabetes increases. These new findings show that amylin deposits can also build up and form plaques in the brain, similar to amyloid plaques found in Alzheimer's disease. The researchers examined post-mortem brain tissue from three groups of volunteers older than 70 years: those who had diabetes and dementia (vascular dementia or Alzheimer's), those who had Alzheimer's but no diabetes, and those free of these disorders. Investigators found significant amylin deposits in the brain tissue of people with both dementia and diabetes. Surprisingly, they also found amylin in people with Alzheimer's but without diabetes—perhaps because these individuals had undiagnosed insulin resistance. The healthy controls had few amylin deposits. The study, led by Dr. Florin Despa, may explain why people with diabetes are at risk for dementia. Like amyloid, amylin circulates in the blood and, during the disease process, is overproduced and not cleared normally, building up in the brain. Over time, both proteins lead to the loss of brain cells and brain damage. Amylin buildup in the brain's blood vessels may also play a role in amyloid buildup and contribute to risk for Alzheimer's, the study found. All this research also furthers the growing body of science pointing to Alzheimer's as a form of "type-3 diabetes".